FSA is now on Choon! Music from Skin Contact and Fugue State is now available on Choon, another site that pays artists for every play using cryptocurrency. So far, I think I like it a little better than Musicoin.org. Seems a bit more listener-friendly on first impression. The FSA website is back online after a hacking incident. Due to my own negligence, the most recent backup was missing pretty much everything since getting the site back online the first time. The actual content was/is on my PC, so it’s really only news posts that got lost. I think everything that was here before is back, and then some. See the main SC site for further news on remixes, collabs, and other stuff that happened over the last year or so. 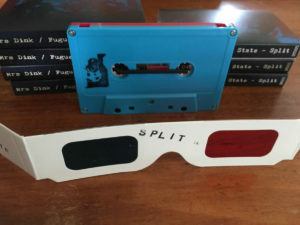 Fugue State releases on Degenerate Trifecta: there has been a digital EP and a split with Mrs. Dink on cassette/digital, which I’m very excited about. In other news, Fugue State Audio is now on the blockchain. I have started posting on Steemit, and have uploaded a bunch of stuff from the backcatalog on Musicoin.org and Dsound, which is a sort of SoundCloud-alike linked to the Steemit platform. I haven’t completely decided to ditch everything else in favor of these yet, but I will be focusing more on these from here on out. Divisor – noise machine based on digital logic. MDLX – modulated delay effect. 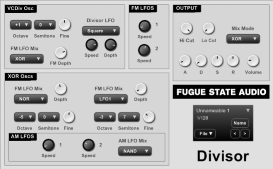 Also added a pack of FlowStone modules here. This is a noise compilation of sorts I took part in, organized by The Network Of Individualized Sonic Extremism. The reason I say “of sorts” is because, rather than containing a bunch of individual tracks from various artists, it consists of one 15-minute track containing layers from each participant. Each artist contributed 3 minutes of audio, which could be spread across the 15-minute timeline however you wished. The other artists who contributed are Digestion Machine, Monskor, Teuthis Galore, Radioactive Wastelands, Nygatoria, SPACEGHOST, and The Dreaming Corpse. Contains remixes of tracks from past SC releases, plus a few previously unreleased tracks. Two of these tracks (debase and downcycle) come from deep in the vaults, around 1998. The source material used on all 3 of these tracks was the last recording made on my old PC before it died. It was a short bit of knob-tweaking from one of my DIY machines, which has been timestretched, cut up, and otherwise mangled into an EP-length collection of drones and noise. Both of these are available as pay-what-you-want digital releases in multiple formats from the SC bandcamp page. Music from my various projects and noise from my DIY devices.